I've read a lot of wonderful teen fiction from Entangled Teen over the years and even some that just didn't work for me. 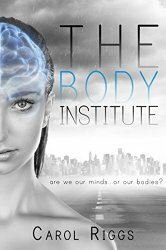 THE BODY INSTITUTE, however, is one of the most phenomenal reads I've had with the imprint to date. Not only does it touch on themes that could easily skew dystopian such as the government's control over a person's body, it also address issues of what makes a person a person. It felt much longer than it was because it packed so much into one novel. While a romance is a part of the overall story and I found it to be very unique and enjoyable, I was considerably more swept up in the pseudo science used in the world building. If you're looking for a great book club read for teens I think this would make for excellent conversations about the factors that play a role in a person's physical, emotional, and mental well being. I feel like young women in particular would greatly benefit from reading this and discussing it's themes. It could be deemed a little controversial due to the focus on how weight and health revolve around one another but ultimately it is this that makes it interesting. I was quite certain going into TBI that I would like it but I'd not expected to love it and want to tell everyone I know about it. While I can't imagine it every being into one, I think it would be marvelous as a film. It's everything I love in entertainment—romance, action, family, and social issues all wrapped up into one package. If you have a tween or teenage daughter I can't recommend this one enough. A RhiReading must read recommendation!